Pop-up dinners are—you guessed it—popping up just about everywhere. These foodie events range from educational to esoteric. Whatever their focus, they put out some seriously delicious eats. New Orleans is a destination where food, music, and magic mix. Chef Nick Brune, who has roots in Louisiana, has tried to bring that same synergy to San Diego with SoundBite. This pop-up dinner series fuses music and food with its unique formula: Local musicians give two pieces of their music to three local chefs. Each chef then creates a dish based on their own interpretation of the music they received. The result is what its creators call a “multi-sensory” dining experience: A six-course dinner, with each course presented by its chef, who explains how the music influenced it, all while the musician plays the music live. SoundBite occasionally migrates to Los Angeles, but its home is here in San Diego, where it takes place roughly every two months at Lot 8 in Mission Valley. The dinners are capped at 60 guests and tend to sell out tout de suite. The next dinner is planned for April 26; take a look at the schedule and act fast to be a part of this ephemeral experience. Part seafood-cooking demonstration, part foodie hangout, part fundraiser. Call it what you will—Collaboration Kitchen is a monthly-ish gathering where a guest chef teaches an audience how to cook several seafood dishes, sometimes accompanied by a guest cheesemaker or vintner. Then, those in attendance eat. 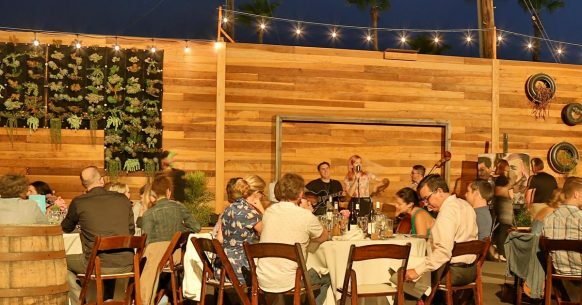 Organized by seafood distributor Catalina Offshore Products, these dinners take place in a warehouse just off Mission Bay. Events are only advertised on social media. Hint: Follow Collaboration Kitchen on Facebook. There is nothing boring or predictable about this pop-up dinner. Its head chef, who goes by Chef Bear, wears a bear costume. The dinners are held in secret locations that diners only find out about via email the day before the dinner. Cow by Bear dinners always feature a 50-day dry aged ribeye roast as the main course (now the name kind of makes sense, right?). They’re held every Thursday, Friday, and Saturday at 8:00 PM in San Diego, and are limited to 14 guests. $195 per person buys a cocktail and five courses, three of which are paired with fine wines. They do brunches, too. The idea behind this pop-up dinner series is breaking bread with the local farmers, chefs, winemakers, ranchers, and fishermen who supply everything on the menu. And indeed, local food producers who fit those descriptions attend each of the dinners, which take place quarterly. The 40 or so guests will each be seated next to a food producer while they enjoy specialty cocktails and appetizers followed by a four-course dinner. The price depends on that night’s menu. Check Farm to Fork San Diego for details.